Elizabeth has been commando crawling (dragging herself around on her belly) for about a month now. I know she can crawl though because I've seen her do it. I understand that crawling is probably difficult on the wooden floor but surely it's easier on the playmat and in her cot? 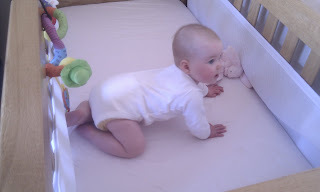 I managed to snap this photo (down below) of her on all-fours and I wonder if she will ever take to proper crawling. Once that happens though, she'll be standing. She already pulls herself up but can't quite get her feet under her yet. Scary!